I have been running some server instances in VirtualBox recently and as I move between networks it is a pain to have to log in and get the IP address from ipconfig before being able to access the test web sites I have running in them. I also prefer to SSH to them rather than use the VirtualBox instance (it gives better character screen size, although I could reconfigure things; I also tab my terminals). Anyway, in order to make things easier I put together two scripts, one that handles getting the IP address of the Virtualbox instance, and the other that handles connecting via SSH just by telling it the instance name. In order to do this you need to install the VirtualBox Guest Additions. 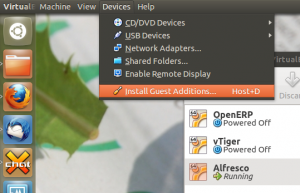 This package is generally used in connection with video drivers for GUI based guests, but it also has some extensions that present extra information about the guest to the host machine. It will complain about not having found X to install the graphics drivers, but this isn’t a problem. where <vname> is the name of your guest. This will list out all of the available information that can now be accessed. This second one is a little more involved because it first deletes the entry from the known_host file (remember to change the location). I’ve done this to stop an error coming up if the IP address has already been used, which isn’t uncommon with DHCP leases (you often get the same one, but not always!). You will have to confirm the authenticity of the host each time you connect, but since this is scripted and the IP has been automatically obtained locally to the machine this shouldn’t present a security risk. You will need to adjust for whever you have put these scripts, I tend to have a scripts directory in my home directory for this purpose.